Product prices and availability are accurate as of 2019-04-20 11:12:06 EDT and are subject to change. Any price and availability information displayed on http://www.amazon.com/ at the time of purchase will apply to the purchase of this product. 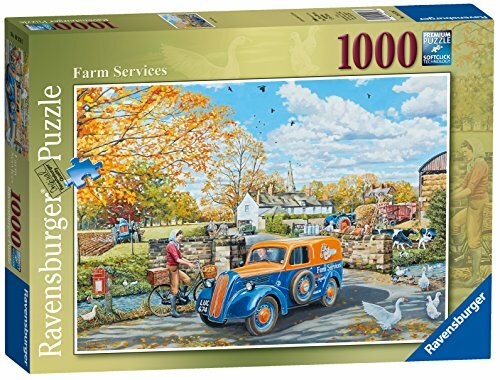 This nostalgic jigsaw puzzle depicts an idyllic farming scene on a sparkling autumn day. A mechanic stops for a quick chat after finishing servicing a pair of hard-working tractors. Behind him, the farmyard is a scene of activity with cows returning to their field after milking, ducks and geese enjoying themselves around the pretty little stream and a heavy horse due to arrive at any moment. Beyond this we see pretty whitewashed and red-bricked cottages, and the spire of the local church. 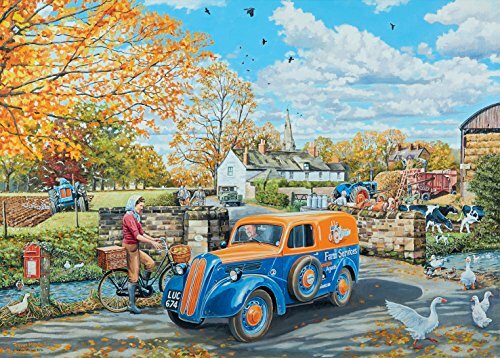 Trevor Mitchell’s painting perfectly captures the clear, bright tones and the fresh, crisp feel of autumn! The vehicles shown in this image are a Land Rover, a Fordson E494C 5cwt van, and 2 Fordson Major tractors (E27N on the right and a 1950’s New Major on the left). Includes in-box A4 colour leaflet showing puzzle image for reference, information about the image and artist's biography. High quality 1000 piece cardboard jigsaw puzzle. The finished puzzle measures 70 x 50cm when complete. Suitable for ages 12 years and up. Made from strong premium grade cardboard, with linen finish print to minimise glare on puzzle image. 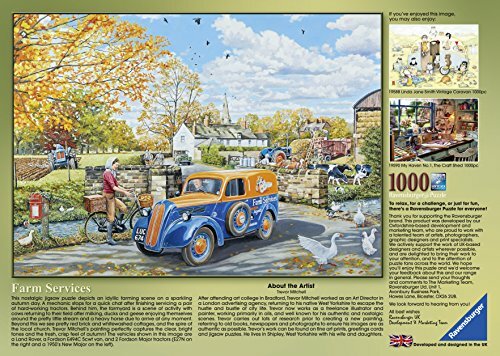 Wonderfully bright, vibrant and detailed jigsaw puzzle Nostalgic countryside scene Includes images of vintage tractors and vehicles Illustrated by Yorkshire-based artist Trevor Mitchell High quality 1000pc puzzle. Puzzle measures 69.9 x 49.7cm when complete.